Although heavyweight contender Luis Ortiz is officially listed as being 39 years of age many people seem to feel he is in fact a fair bit older. If Ortiz has lied about his age he is of course far from the first boxer to have done so. In speaking with Premier Boxing Champions, the once-beaten Cuban southpaw brought up the subject of his age and he said that if he is so old, then why are the top fighters such as Anthony Joshua avoiding him? Ortiz, who may have unintentionally let it slip that yes, he is older than 39, stated that “I could be 50 and still beat these guys.” Now, Ortiz may be the wrong side of 40 but surely he’s not reached his half-century yet, has he! 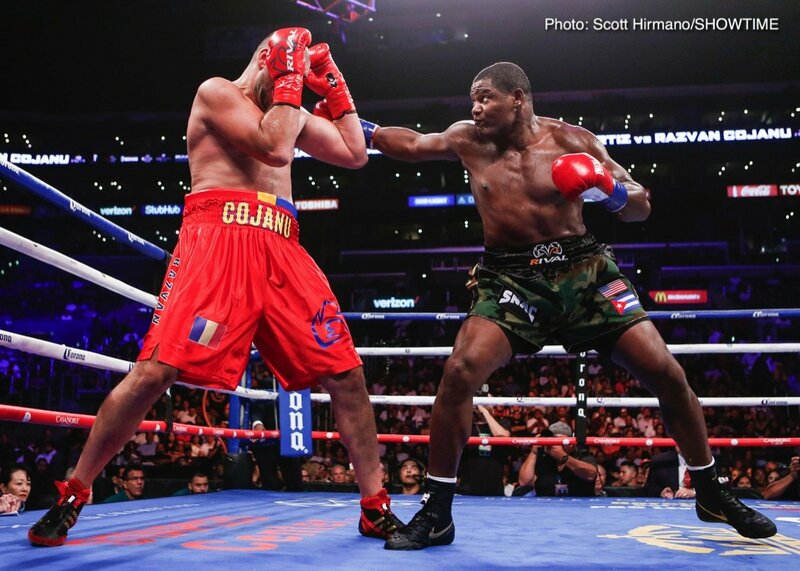 Regardless, Ortiz, 29-1(25) and coming off a reasonably impressive two-round stoppage win over Razvan Cojanu, says the champions are running from him – Joshua especially. Strong words. In Joshua’s defence (and absolutely every heavyweight wants a piece of him and the big payday that would come with the fight) he had to fight Alexander Povetkin, his WBA mandatory, and now that Wilder has KO’d Ortiz, Joshua would have gotten real stick if he was fighting him next. And why does Wilder owe Ortiz a return fight? Wilder, who says he tried his best to make the AJ fight, is now looking at another big one against Tyson Fury. Whether he likes it or not, the KO loss he suffered at the hands of Wilder placed Ortiz further back in line for another big fight/title shot. It’s true, the 39 year old/40-something/50 year old is a danger-man, but are the two reigning heavyweight champions Wilder and Joshua really running from him? Ortiz needs to get himself another big and meaningful win before he can expect another shot at a world title. By then of course he could well be 50.